An artist's impression of a Pioneer spacecraft on its way to interstellar space. Investigate the nature of the asteroid belt from the scientific standpoint and assess the belt's possible hazard to missions to the outer planets. Explore the environment of Jupiter. The interplanetary medium (IPM) is the material which fills the Solar System, and through which all the larger Solar System bodies, such as planets, dwarf planets, asteroids, and comets, move. Map the magnetic field of Saturn and determine its intensity, direction, and structure. Determine how many electrons and protons of various energies are distributed along the trajectory of the spacecraft through the Saturn system. Map the interaction of the Saturn system with the solar wind. Measure the temperature of Saturn's atmosphere and that of Titan, the largest satellite of Saturn. Determine the structure of the upper atmosphere of Saturn where molecules are expected to be electrically charged and form an ionosphere. Map the thermal structure of Saturn's atmosphere by infrared observations coupled with radio occultation data. Obtain spin-scan images of the Saturnian system in two colors during the encounter sequence and polarimetry measurements of the planet. Probe the ring system and the atmosphere of Saturn with S-band radio occultation. 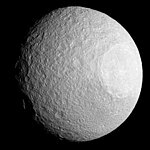 Determine more precisely the masses of Saturn and its larger satellites by accurate observations of the effects of their gravitational fields on the motion of the spacecraft. TRW Inc. was an American corporation involved in a variety of businesses, mainly aerospace, automotive, and credit reporting. It was a pioneer in multiple fields including electronic components, integrated circuits, computers, software and systems engineering. TRW built many spacecraft, including Pioneer 1, Pioneer 10, and several space-based observatories. It was #57 on the 1986 Fortune 500 list, and had 122,258 employees. In 1958 the company was called Thompson Ramo Wooldridge, after three prominent leaders. This was later shortened to TRW. Passage through the asteroid belt. 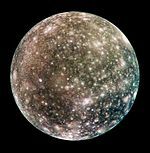 Callisto flyby at 786,500 km. Ganymede flyby at 692,300 km. Io flyby at 314,000 km. 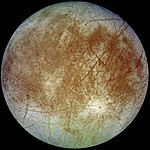 Europa flyby at 586,700 km. Jupiter closest approach at 42,828 km. Amalthea flyby at 127,500 km. 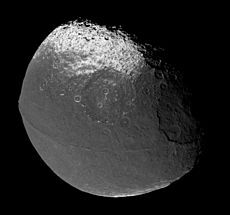 Iapetus flyby at 1,032,535 km. Phoebe flyby at 13,713,574 km. Hyperion flyby at 666,153 km. Epimetheus flyby at 6,676 km. Atlas flyby at 45,960 km. Dione flyby at 291,556 km. Mimas flyby at 104,263 km. Saturn closest approach at 20,591 km. Janus flyby at 228,988 km. 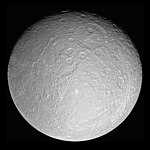 Tethys flyby at 329,197 km. 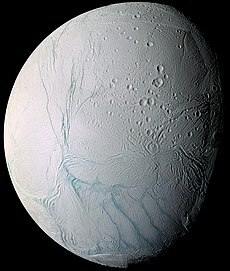 Enceladus flyby at 222,027 km. Calypso flyby at 109,916 km. Rhea flyby at 345,303 km. Titan flyby at 362,962 km. Instrument power sharing began due to declining generator power output. Passed the orbit of Pluto. Routine daily mission operations stopped. 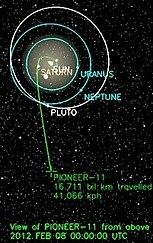 Pioneer 11 is 6.5 billion km from Earth. 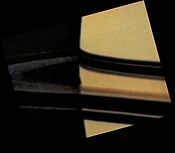 Pioneer 11 passed by Saturn on September 1, 1979, at a distance of 21,000 km from Saturn's cloud tops. 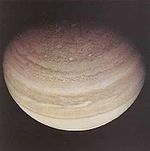 By this time Voyager 1 and Voyager 2 had already passed Jupiter and were also en route to Saturn, so it was decided to target Pioneer 11 to pass through the Saturn ring plane at the same position that the soon-to-come Voyager probes would use in order to test the route before the Voyagers arrived. If there were faint ring particles that could damage a probe in that area, mission planners felt it was better to learn about it via Pioneer. Thus, Pioneer 11 was acting as a "pioneer" in a true sense of the word; if danger were detected, then the Voyager probes could be rerouted further away from the rings, but missing the opportunity to visit Uranus and Neptune in the process. Pioneer 11 imaged and nearly collided with one of Saturn's small moons, passing at a distance of no more than 4,000 kilometers (2,500 mi). The object was tentatively identified as Epimetheus, a moon discovered the previous day from Pioneer's imaging, and suspected from earlier observations by Earth-based telescopes. After the Voyager flybys, it became known that there are two similarly-sized moons (Epimetheus and Janus) in the same orbit, so there is some uncertainty about which one was the object of Pioneer's near-miss. 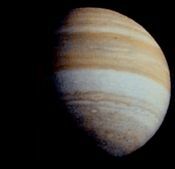 Pioneer 11 encountered Janus on September 1, 1979 at 14:52 UTC at a distance of 2500 km and Mimas at 16:20 UTC the same day at 103000 km. Besides Epimetheus, instruments located another previously undiscovered small moon and an additional ring, charted Saturn's magnetosphere and magnetic field and found its planet-size moon, Titan, to be too cold for life. Hurtling underneath the ring plane, the probe sent back pictures of Saturn's rings. 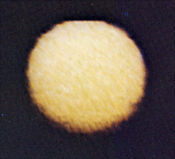 The rings, which normally seem bright when observed from Earth, appeared dark in the Pioneer pictures, and the dark gaps in the rings seen from Earth appeared as bright rings. 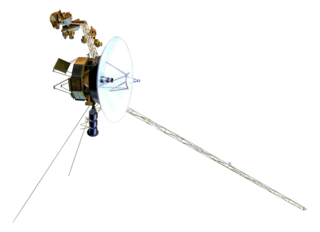 Voyager 1 is a space probe launched by NASA on September 5, 1977. Part of the Voyager program to study the outer Solar System, Voyager 1 was launched 16 days after its twin, Voyager 2. Having operated for 41 years, 7 months and 6 days as of April 11, 2019, the spacecraft still communicates with the Deep Space Network to receive routine commands and to transmit data to Earth. At a distance of 145 AU from Earth as of February 22, 2019, it is the most distant from Earth of all known human-made objects. 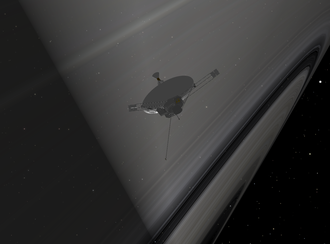 The exploration of Saturn has been solely performed by crewless probes. Three missions were flybys, which formed an extended foundation of knowledge about the system. 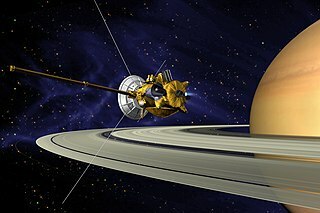 The Cassini–Huygens spacecraft, launched in 1997, was in orbit from 2004 to 2017. 1 2 3 4 5 6 7 Fimmel, R. O.; Swindell, W.; Burgess, E. Pioneer Odyssey. SP-349/396. 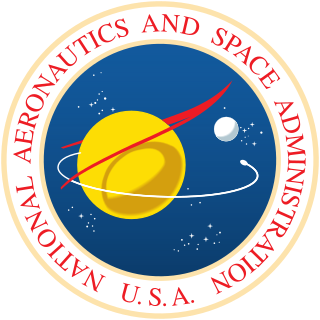 Washington, D.C.: NASA-Ames Research Center. OCLC 3211441 . Retrieved 9 January 2011. 1 2 3 4 "Pioneer 11: In Depth" . Retrieved 10 December 2017. ↑ Wade, Mark. "Pioneer 10-11". Encyclopedia Astronautica. Archived from the original on 2010-11-20. Retrieved 2011-02-08. ↑ "Weebau Spaceflight Encyclopedia". 9 November 2010. Retrieved 12 January 2012. ↑ "Pioneer 10 & 11". solarviews.com. Retrieved 2018-12-20. ↑ "Magnetic Fields". NASA / National Space Science Data Center. Retrieved 2011-02-19. ↑ "Quadrispherical Plasma Analyzer". NASA / National Space Science Data Center. Retrieved 2011-02-19. 1 2 3 4 5 6 7 8 9 10 Simpson 2001, p. 146. ↑ "Charged Particle Instrument (CPI)". NASA / National Space Science Data Center. Retrieved 2011-02-19. ↑ "Cosmic-Ray Spectra". NASA / National Space Science Data Center. Retrieved 2011-02-19. ↑ "Geiger Tube Telescope (GTT)". NASA / National Space Science Data Center. Retrieved 2011-02-19. ↑ "Jovian Trapped Radiation". NASA / National Space Science Data Center. Retrieved 2011-02-19. ↑ "Meteoroid Detectors". NASA / National Space Science Data Center. Retrieved 2011-02-19. ↑ "Asteroid/Meteoroid Astronomy". NASA / National Space Science Data Center. Retrieved 2011-02-19. ↑ "Ultraviolet Photometry". NASA / National Space Science Data Center. Retrieved 2011-02-19. ↑ "Imaging Photopolarimeter (IPP)". NASA / National Space Science Data Center. Retrieved 2011-02-19. ↑ "Infrared Radiometers". NASA / National Space Science Data Center. Retrieved 2011-02-19. ↑ "Jovian Magnetic Field". NASA / National Space Science Data Center. Retrieved 2013-09-24. 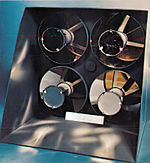 1 2 "Pioneer 11 Mission Information". Archived from the original on 21 July 2011. Retrieved 23 January 2011. ↑ Muller, Daniel. 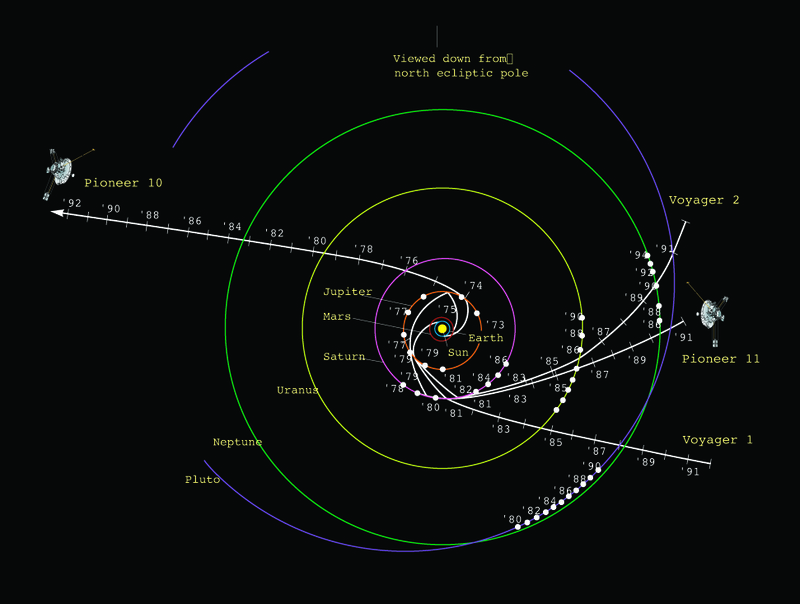 "Pioneer 11 Full Mission Timeline". Daniel Muller. Retrieved 9 January 2011. ↑ "Pioneer 11 Successfully Retargeted for Saturn". New Scientist. 9 May 1974. Retrieved 5 December 2017. 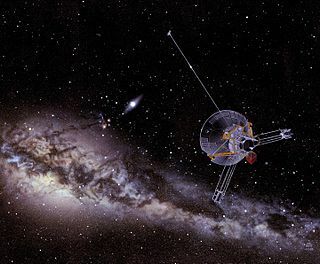 ↑ "Pioneer 11 Is Reported to Leave Solar System". 25 February 1990. Retrieved 3 December 2017. 1 2 "Farewell to a Pioneer". Science News. 14 October 1995. 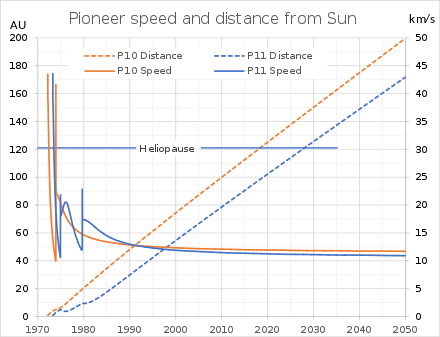 ↑ "Pioneer 11 to End Operations after Epic Career". NASA / Ames Research Center. September 29, 1995. Retrieved August 7, 2011. ↑ Howell, Elizabeth. 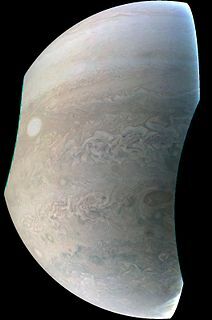 "Pioneer 11: Up Close with Jupiter & Saturn". Space.com. Retrieved 10 December 2017. ↑ "Future stellar flybys of the Voyager and Pioneer spacecraft". RNAAS 3, 59. 3 April 2019. Retrieved 3 April 2019. ↑ Britt, Robert Roy (October 18, 2004). "The Problem with Gravity: New Mission Would Probe Strange Puzzle". Space.com . Retrieved 2011-06-07. The discrepancy caused by the anomaly amounts to about 248,500 miles (399,900 kilometres), or roughly the distance between Earth and the Moon. That's how much farther the probes should have traveled in their 34 years, if our understanding of gravity is correct. ↑ "Pioneer Anomaly Solved!". The Planetary Society. Retrieved 2012-04-20. ↑ Kronish, Syd (27 October 1991). "Space Launches are Featured" . Retrieved 5 December 2017. Wikimedia Commons has media related to Pioneer program . | Pioneer: First to Jupiter, Saturn, and beyond, Richard O. Fimmel, NASA SP-446, 1980, about the Pioneer project but especially about the Pioneer 11 mission.